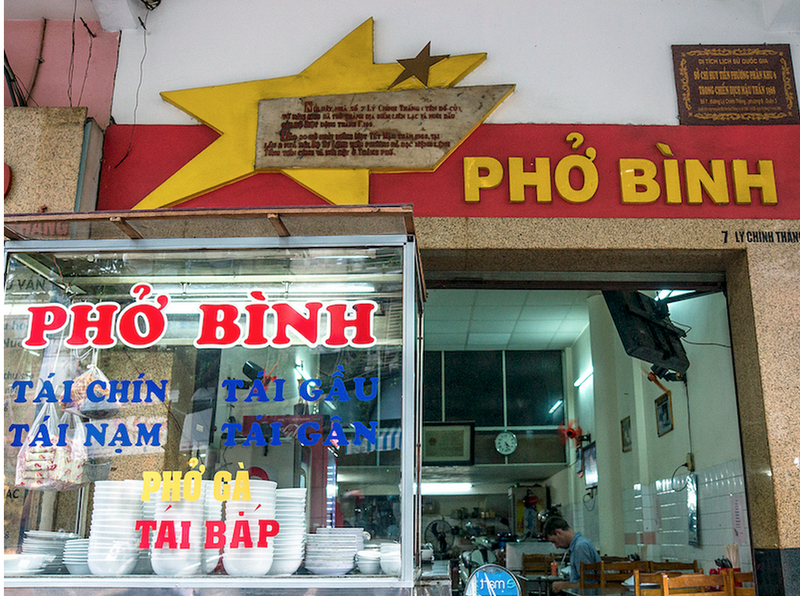 Pho Binh, or Peace Soup, is a modest restaurant churning out pho bo, Vietnam’s traditional beef noodle soup, just like hundreds of others in Ho Chi Minh City. However, hungry customers who venture to the second floor of the three-storey house will witness the room where men and women debated, planned and ordered an irreversible and unforgettable slice of history. The Tet Offensive began here at 7 Ly Chinh Thang in District 3 and went on to change the course of the American War. Historians use places like this to exemplify Saigon as a veritable goldmine weaved with secret tunnels and cellars hidden beneath commonplace buildings. These were used to launch guerrilla campaigns against the French and Americans. What makes Pho Binh even more exceptional was its proximity to the enemy. The owner, Dong Chi Ngo Toai, who died nine years ago at the age of 96, would only have to walk 100 yards up the street to see the military police headquarters and simply nip downstairs to serve the American soldiers who frequented the restaurant during the war’s peak. Now former northern Vietnamese soldier Nguyen Thanh Minh, 65, takes curious guests above the kitchen to the long room spread with red and white tiles kept glossy in the glow of sunshine from the large front window and stark ceiling lights. It’s easy to imagine the revolutionaries sprawling maps on these same 55-year-old wooden tables in the final days before launching the offensive on January 30, 1968, taking the forces of South Vietnam, the US, and their allies by surprise. The action triggered a landslide of anti-war demonstrations in the US following images of American casualties portrayed in the world’s media. Minh, who says he remembers “a lot of death” during the war, was himself injured while hiding from bombs in a tunnel in his home city of Hue. The lengthy scar on his left shin is a harsh reminder. There are plenty of signs the restaurant attracts people interested in more than the soup. As well as Minh gesturing for each visitor who goes upstairs to have their pictures taken at the tables, one of the walls has about a dozen photographs and notes from tourists, while the business which has served people since 1953 has been mentioned in several guidebooks. The laminated notes pinned on the wall express gratitude for the “delicious” soup along with thanks to the owner for helping bring the war to an end, as if the guests were having an internal battle over which should take priority. The opposing wall is plastered with portraits of the very people who launched the offensive in this room, all of whom have likely died since. The owner’s son still works in the kitchen sometimes. Most of the resistance in the city during the First Indochina War and the American War was happening underground. It’s harder to gauge the impact of propaganda publishing sites compared to an overt campaign like the Tet Offensive but the sheer number of cellars dug out for printing material and stocking weapons that have been discovered shows their importance. One of them, known as Secret Cellar B, was dug in 1952 during the war against French colonialism and lies beneath a former family home at 122/351 Ngo Gia Tu, District 10. During its five years of service, the covert printing press published leaflets about the latest news transcribed from northern radio broadcasts. Historian and author of Exploring Ho Chi Minh City, Tim Doling, says it was abandoned in December 1957 and stuffed with soil-filled containers when it was decommissioned in 1959. This preserved the structure intact until after reunification. Visitors access the cellar by walking to a wardrobe in the corner of the rear bedroom, opening the door and climbing down a ladder into an underground tunnel through a secret hatch in the floor. The real entrance slopes down a narrow tube about 10 meters long to the cellar where there are displays and two mannequins, one of them on a typewriter. Visitors can see Secret Cellar B by arranging a viewing with the District 10 Office of Culture, Sports and Tourism at 474 3 Thang 2 Street in District 10. A continuous flow of tourists explore the extensive network of tunnels in the Cu Chi district. The northern Vietnamese soldiers were aided by the Phu Thao Hoa tunnels dug beneath cassava fields in the city’s northwest suburb of Tan Phu in 1947. Tim says these tunnels, packed with weapons, food and medical supplies, acted as a prototype to future tunnels and played a crucial role in the First Indochina War. And in the American War there was a surge of claustrophobic weapon storage cellars. On the evening of January 30, 1968, a 19-strong team used weapons stored in District 3 in an attack against the palace where all members died. The cellar was not discovered at the time. These intriguing cellars were originally restored by the authorities for school trips and aren’t yet prepared for the mass tourism market. Tim has introduced tourism companies to the administrator of two District 10 cellars in an effort to popularize these enigmatic sites and make use of the city’s rich history and heritage.